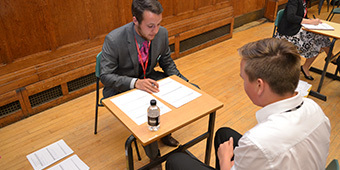 Year 11 students benefit from mock interviews with genuine local employers. On Wednesday 19th October, Beverley 6th Formers from Beverley Grammar, High School and Longcroft attended an event to highlight the many options available to our students once they leave 6th Form. Download the letters sent home about the 6th Form Working Choices Event, and the Post-16 Options Evening for Year 11 students and parents here.